Super Bowl LII has been a perfect storm in the best possible way for NBC Sports Regional Networks. Not only is the Peacock mothership carrying the big game itself, but both competitors are from cities that are home to its RSNs. NBC Boston and NBC Philadelphia are taking full advantage, collaborating on both programming and onsite sets at Radio Row at the Mall of America all week and at U.S. Bank Stadium on Super Bowl Sunday. 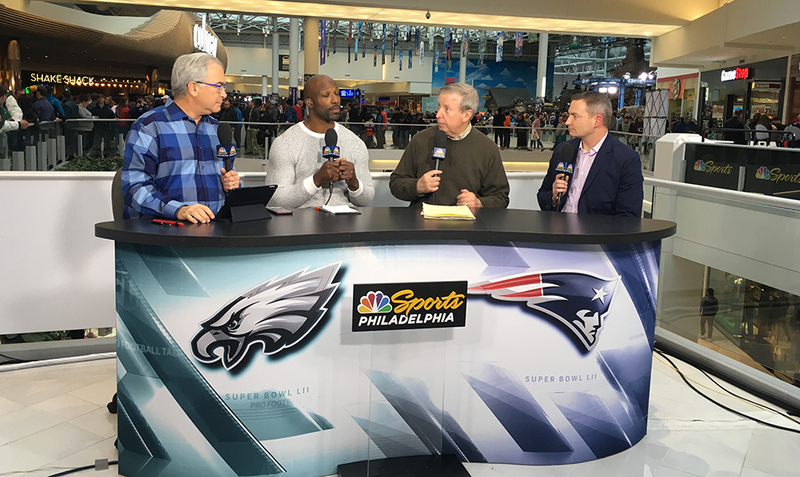 Throughout the week, the Boston and Philadelphia RSNs shared two studios on Radio Row at the Mall of America. 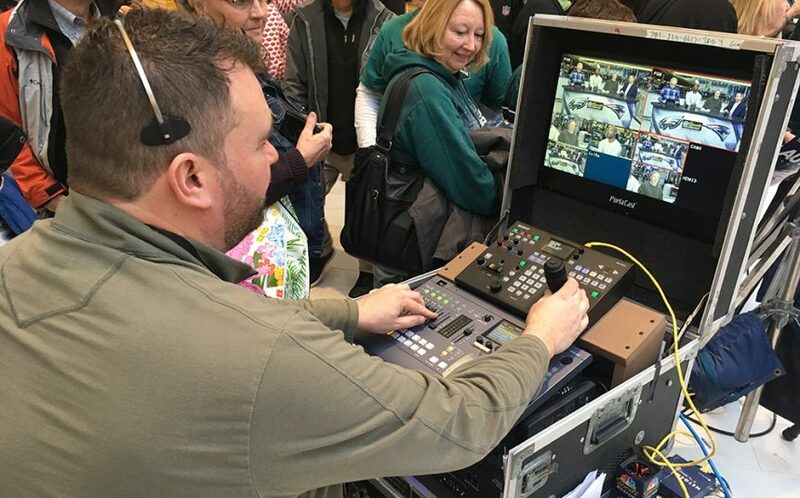 The primary set featured three robotic cameras and relied on a flypack system used regularly by NBC Sports Boston, sending feeds to control rooms at the two RSNs’ respective home facilities, where the shows were produced. NBCSN’s PFT Live also used this studio each morning this week but pulled up a full mobile unit rather than using the flypack. The branding in the front of the desk was easily swapped out for the network using the set. The branding of the second set on the opposite side of Radio Row could also be customized, not only for Boston and Philadelphia but also for live Super Bowl hits by other NBC RSNs. This afternoon, Boston and Philly have a tented set outside U.S. Bank Stadium for their respective pregame coverage. NBC Sports Boston will pretape two hours of pregame at the set (which CNBC also used for a live show on Friday evening) to air at 1-3 p.m. ET, and NBC Sports Philadelphia will be live from the set at 3-5 p.m. At that point, the two will come together for a one-hour combo show featuring on-air talent from both markets leading up to kickoff. The branding in the front of the desk could be easily changed to the network using the set. As for postgame, Boston will man the same outdoor set, and Philly will be inside the stadium, producing its show from NBC Sports’ Coach’s Clicker set (the two live-streamed a coin flip to determine who would get the interior set). 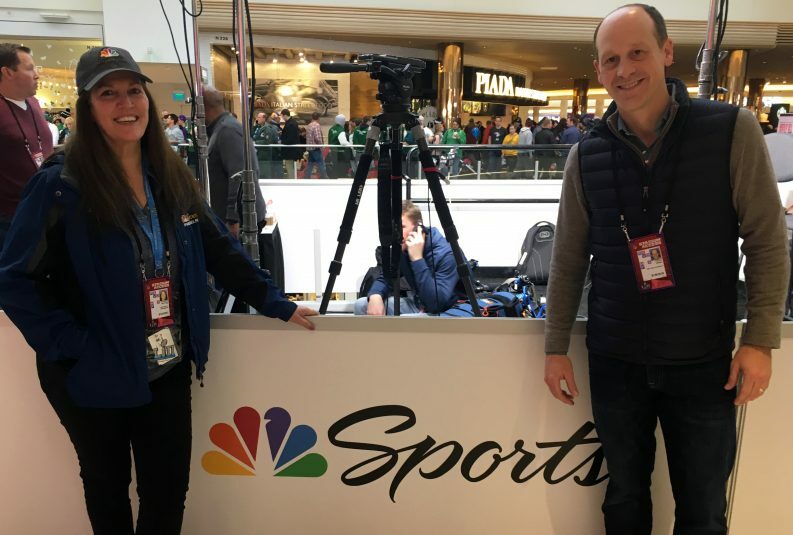 NBC Sports’ operations team has also played a major role in the two RSNs’ success in Minneapolis. In addition to NBC Sports, RSNs from across the country are chipping in, including a tech operator from NBC Sports Bay Area, two producers from Mid-Atlantic, photographers from Chicago and Bay Area, and others. Check out a more in-depth look at the Super Bowl programming slate and multiplatform efforts for NBC Sports Boston and NBC Sports Philadelphia.